You’re not the only one looking to stop snoring. It is estimated that 87 million Americans snore each night. During sleep, the muscles and soft tissues in the throat relax, making the breathing airway smaller. The decrease in the airway space increases the speed of air that travels through the airway while the sleeper during the breaths. As the velocity of required air is increased in the constricted space, soft tissues like the soft palate and the uvula vibrate, thus causing the snoring noise that ruins the nights of many sleepers. While snoring in and of itself has no dangerous side effects (other than keeping your partner awake at night), it could be a symptom of something much more dangerous: Obstructed Sleep Apnea (OSA). 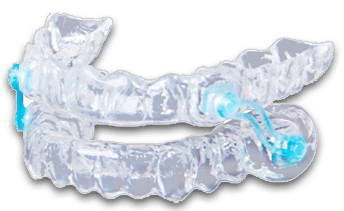 At Levittown Family Dental Associates, Dr. Abrams can create a custom dental device that can be worn at night. The device moves the lower jaw forward and helps open the airway to stop the snoring and give you a more restful sleep.